C brought along a magnificient pannetone for Christmas but we were too full to enjoy it so it stood forlornly on the cake stand until last weekend, when we invited Sui Mai and her very soon-to-be husband over for steamboat and mahjong. 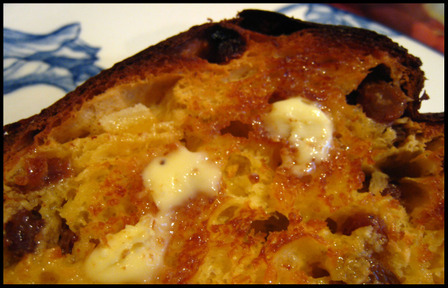 Sliced, toasted and then buttered is my favourite way of enjoying it, pairing comfortably with a cup of milky tea. The Italians eat it with a glass of sweet sparkling Asti which strikes me as a lovely idea too. 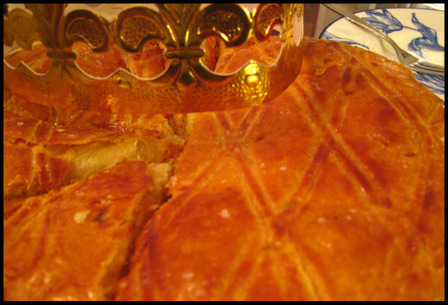 As for the French, there is always the tradition of La Galette des Rois, a round pie/cake of puff pastry with almondy frangipane filling. This pie is made and eaten in celebration of L'Épiphany, the feast day reliving how the three kings found baby Jesus. The kings took twelve nights to find the baby whom we all know was born in a lowly manger with presumably no address, hence the last day of Christmas is also known as Twelfth Night. Also the time to take down the decorations and put up some red and gold Chinese New Year trimmings. Hidden in each galette is a little favour, in olden days it was a fève (pea) but these days anything goes, like in the galette brought over by Sui Mai, we found a tiny ceramic Bambi. The person who finds the fève gets to wear a golden crown and is treated like a king or queen. Rather fun, especially if the galette tastes good. It should have light flaky crust with a filling that is not too rich or sweet. All the versions I've tasted, well all two of it so far, were yummy. Every baker is selling them until end of January, and chances are restaurants and dinner party hosts will also be featuring this festive cake in their menu. At Maison du Chocolat they even have a version split it in half horizontally and sandwiched with dark chocolate.